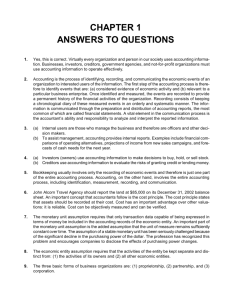  Analyze the effects of business transactions on the accounting equation. the economic events of an organization to interested users. 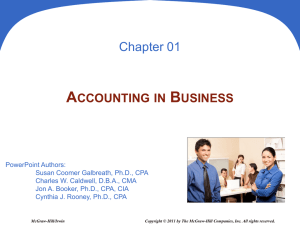 LO 1 Explain what accounting is. 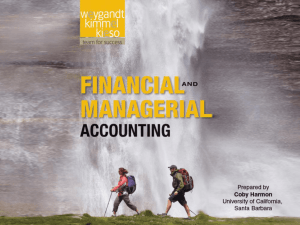 corporate accounting because of unethical financial reporting. Congress passed Sarbanes-Oxley Act of (SOX) 2002. LO 3 Understand why ethics is a fundamental business concept. 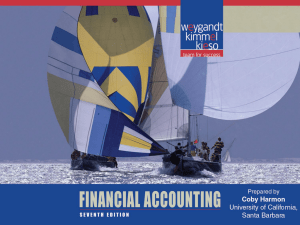 LO 4 Explain generally accepted accounting principles. 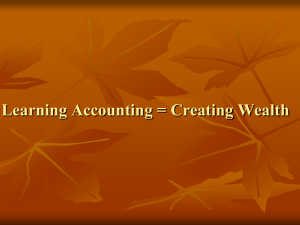 companies record assets at their cost. and the economic entity assumption. Assets are claimed by either creditors or owners. Claims of creditors must be paid before ownership claims. 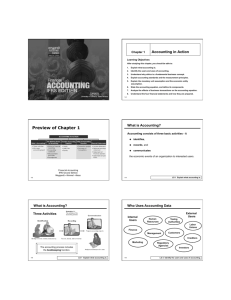 LO 6 State the accounting equation, and define its components. Provide future services or benefits. Claims against assets (debts and obligations). Creditors - party to whom money is owed. 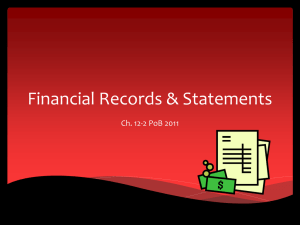 Accounts payable, Notes payable, etc. Ownership claim on total assets. Referred to as residual equity. the process of earning revenue. utilities expense, tax expense, etc. 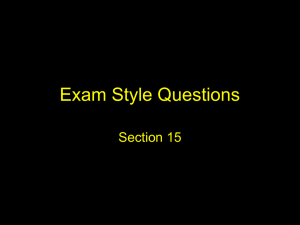 May be external or internal. Not all activities represent transactions. 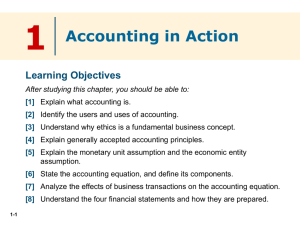 LO 7 Analyze the effects of business transactions on the accounting equation. 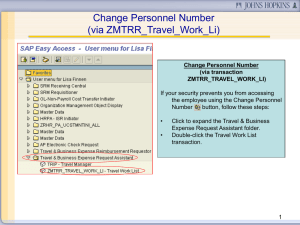 owner’s equity) of the company changed? invests $15,000 cash in the business. computer equipment for $7,000 cash. months. The purchase is made on account. programming services it has provided. for advertising but postpones payment until a later date. and it bills the balance of $2,000 on account. Transaction (8): Softbyte pays its $250 Daily News bill in cash. had been billed for services [in Transaction (6)]. business for his personal use. 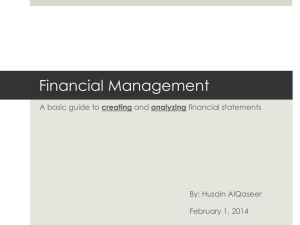 LO 8 Understand the four financial statements and how they are prepared. 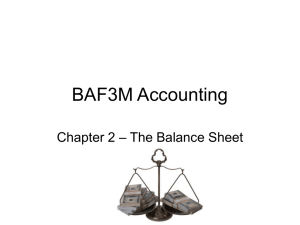 ending balance in owner’s equity. needed to prepare statement of cash flows. Lists revenues first, followed by expenses. Shows net income (or net loss). Total assets must equal total liabilities and owner’s equity. specific moment in time (usually the month-end or yearend). Information for a specific period of time. 1. 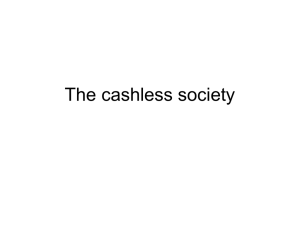 Where did cash come from? 2. What was cash used for? 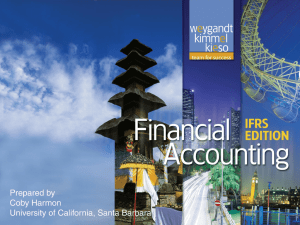 LO 9 Explain the career opportunities in accounting.